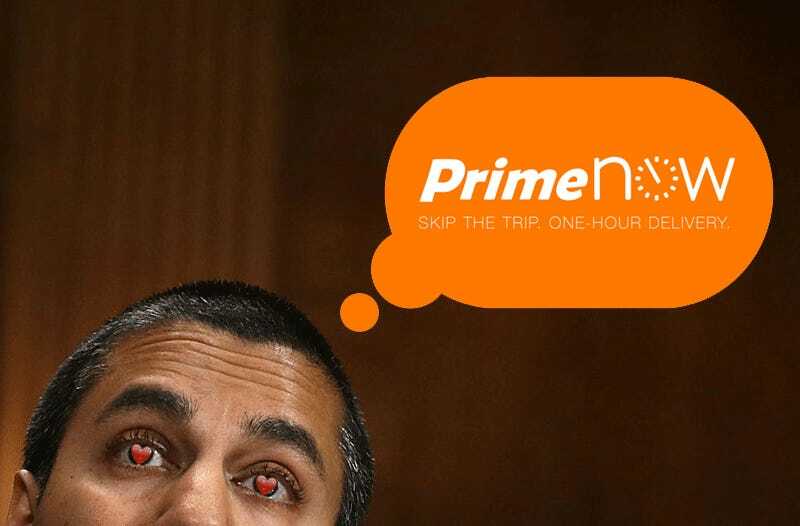 In what appears to be a violation of the federal ethics rule that prohibits a government employee from using “his public office for his own private gain, for the endorsement of any product,” Ajit Pai, the controversial new chair of the FCC, tweeted and subsequently deleted praise for Amazon’s PrimeNow service. “Needed something in pinch & decided to try @amazonprimenow. Very impressed! Item was cheap & arrived early. May not leave the house again,” Pai posted to on his official FCC Twitter account, only to delete moments later. Pai’s tweet appears to violate the same rule from the Code of Federal Regulations that Kellyanne Conway got into trouble with last week, when she encouraged viewers to buy Ivanka Trump’s clothing line on live television. The code clearly prohibits employees from using their “Government position or title or any authority associated with [their] public office to endorse any product, service or enterprise,” so tweeting Amazon praise from his government Twitter account seems in conflict with that, which is perhaps why he swiftly deleted the tweet. Considering Pai chairs an organization that is in charge of regulating cable, radio, satellite, TV, and the internet, showing favoritism toward any technology company is neither a good or an ethical look. Then again, Pai used to be a lawyer for Verizon and plans to get poor people access to wifi using “significant tax incentives,” so a corporate endorsement should come as no surprise. This is far from the first time Pai has tweeted praise for Amazon, but it is the first time he’s done since taking office. This guy really loves Amazon, eh? It remains to be seen whether Conway will actually be disciplined for her ethics violation. (On top that she also recently found herself embroiled in a tweet scandal after tweeting “I love you” at a white nationalist account.) Considering Pai is much less public than her and quickly removed the tweet, he could very well slip through the cracks. Is it good that politicians and government officials tweet because it allows the public to more easily see their ineptitude and corruption? Although the whole thing seems like a huge liability, Twitter isn’t going anywhere. After all, Conway and Pai are really just emulating the behavior of their boss. What&apos;s Going on With Kellyanne Conway&apos;s Twitter Account?